Textus Receptus (Latin: "received text") is the name given to the succession of printed Greek texts of the New Testament which constituted the translation base for the original German Luther Bible, the translation of the New Testament into English by William Tyndale, the King James Version, the Spanish Reina-Valera translation, the Russian Synodal Bible and most Reformation-era New Testament translations throughout Western and Central Europe. 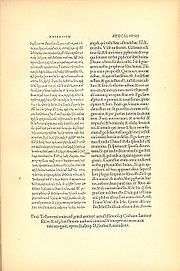 The series originated with the first printed Greek New Testament, published in 1516 – a work undertaken in Basel by the Dutch Catholic scholar, priest and humanist Desiderius Erasmus. This edition of the New Testament represents the tradition of manuscripts of the New Testament as the one that the Orthodox Church has received and used without interruption since the 4th century. They are also the text type used in most Protestant denominations consistently throughout history before the 19th century adoption of the Alexandrian priority position within mainstream Biblical scholarship. Manuscripts of the Byzantine family represent the vast majority of the 5700 manuscripts that have currently been found and collated. The term Textus Receptus may also apply to other ancient texts in other languages, traditionally copied and passed down by scribes. Erasmus had been working for years on two projects: a collation of Greek texts and a fresh Latin New Testament. In 1512, he began his work on a fresh Latin New Testament. He collected all the Vulgate manuscripts he could find to create a critical edition. Then he polished the Latin. He declared, "It is only fair that Paul should address the Romans in somewhat better Latin." In the earlier phases of the project, he never mentioned a Greek text: "My mind is so excited at the thought of emending Jerome’s text, with notes, that I seem to myself inspired by some god. I have already almost finished emending him by collating a large number of ancient manuscripts, and this I am doing at enormous personal expense." While his intentions for publishing a fresh Latin translation are clear, it is less clear why he included the Greek text. Though some speculate that he intended on producing a critical Greek text or that he wanted to beat the Complutensian Polyglot into print, there is no evidence to support this. Rather his motivation may have been simpler: he included the Greek text to prove the superiority of his Latin version. He wrote, "There remains the New Testament translated by me, with the Greek facing, and notes on it by me." He further demonstrated the reason for the inclusion of the Greek text when defending his work: "But one thing the facts cry out, and it can be clear, as they say, even to a blind man, that often through the translator’s clumsiness or inattention the Greek has been wrongly rendered; often the true and genuine reading has been corrupted by ignorant scribes, which we see happen every day, or altered by scribes who are half-taught and half-asleep." Erasmus' new work was published by Froben of Basel in 1516, becoming the first published Greek New Testament, the Novum Instrumentum omne, diligenter ab Erasmo Rot. Recognitum et Emendatum. He used manuscripts: 1, 1rK, 2e, 2ap, 4ap, 7, 817. 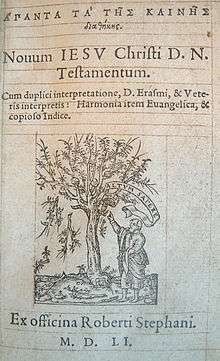 The second edition used the more familiar term Testamentum instead of Instrumentum, and eventually became a major source for Luther's German translation. In the second edition (1519) Erasmus used also Minuscule 3. Typographical errors (attributed to the rush to complete the work) abounded in the published text. Erasmus also lacked a complete copy of the book of Revelation and translated the last six verses back into Greek from the Latin Vulgate in order to finish his edition. Though his work is criticized for that, this is an issue that everyone is faced with when translating the Bible from Greek manuscripts. Erasmus adjusted the text in many places to correspond with readings found in the Vulgate, or as quoted in the Church Fathers; consequently, although the Textus Receptus is classified by scholars as a late Byzantine text, it differs in nearly two thousand readings from the standard form of that text-type, as represented by the "Majority Text" of Hodges and Farstad (Wallace 1989). The edition was a sell-out commercial success and was reprinted in 1519, with most—though not all—the typographical errors corrected. Shortly after Mill published his edition, Daniel Whitby (1638–1725), attacked his work. He claimed that the autographs of the New Testament were identical to the Textus Receptus, and that the text had never been corrupted. He believed the text of the Holy Scripture was endangered by the 30,000 variants in Mill's edition. Whitby claimed that every part of the New Testament should be defended against these variants. Johann Jakob Wettstein's apparatus was fuller than of any previous editor. He introduced the practice of indicating the ancient manuscripts by capital Roman letters and the later manuscripts by Arabic numerals. He published in Basel Prolegomena ad Novi Testamenti Graeci (1731). 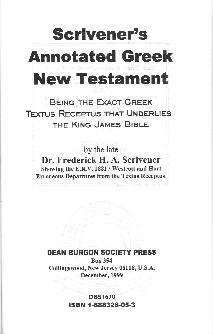 Westcott and Hort published The New Testament in the Original Greek in 1881, in which they rejected what they considered to be the dated and inadequate Textus Receptus. The text is based mainly on Codex Vaticanus in the Gospels. Hills was the first textual critic to defend Textus Receptus. Although others have defended the TR per se, they are either not acknowledged textual critics (e.g. Theodore Letis, David Hocking) or their works are not on a scholarly level (e.g., Terence H. Brown or D. A. Waite). The Textus Receptus was established on a basis of the Byzantine text-type, also called 'Majority text', and usually is identified with it by its followers. F. H. A. Scrivener (1813–1891) remarked that Matt. 22:28, 23:25, 27:52, 28:3, 4, 19, 20; Mark 7:18, 19, 26, 10:1, 12:22, 15:46; Luke 1:16, 61, 2:43, 9:1, 15, 11:49; John 1:28, 10:8, 13:20 are under the influence of Minuscule 1 (Caesarean text-type). Scrivener showed that some texts were incorporated from the Vulgate (for example, Acts 9:6; Rev 17:4.8). Daniel B. Wallace enumerated that in 1,838 places (1005 are translatable) Textus Receptus differs from the Byzantine text-type. Matthew 10:8 it has Alexandrian reading νεκρους εγειρετε (raise the dead) omitted by the Byzantine text. Acts 20:28 it has Alexandrian reading του Θεου (of God) instead of Byzantine του κυριου και του Θεου (of the Lord and God). Green's Literal Translation 1985. Included in 1986 The Interlinear Translation. ↑ For the various Patristic witnesses for the various text types see Westcott-Hort, The New Testament in the Original Greek (1881), authors such as Athanasius of Alexandria used the Alexandrian text type, John Chrysostom used the nascent Byzantine text type, and Jerome and Ephrem the Syrian would've utilized the so-called Western text type; for example. ↑ "Epistle 695" in Collected Works of Erasmus Vol. 5: Letters 594 to 841, 1517-1518 (tr. R.A.B. Mynors and D.F.S. Thomson; annotated by James K. McConica; Toronto: University of Toronto Press, 1976), 172. ↑ "Epistle 273" in Collected Works of Erasmus Vol. 2: Letters 142 to 297, 1501-1514 (tr. R.A.B. Mynors and D.F.S. Thomson; annotated Wallace K. Ferguson; Toronto: University of Toronto Press, 1976), 253. ↑ "Epistle 305" in Collected Works of Erasmus. Vol. 3: Letters 298 to 445, 1514-1516 (tr. R.A.B. Mynors and D.F.S. Thomson; annotated by James K. McConica; Toronto: University of Toronto Press, 1976), 32. 1 2 W. W. Combs, Erasmus and the textus receptus, DBSJ 1 (Spring 1996), 45. ↑ S. P. Tregelles, An Account of the Printed Text of the Greek New Testament, London 1854, p. 29. ↑ An Inquiry into the Integrity of the Greek Vulgate, or Received Text of the New Testament; in which the Greek Manuscripts are newly classed; the Integrity of the Authorised Text vindicated; and the Various Readings traced to their Origin (London, 1815), ch. 1. The sequel mentioned in the text is Nolan's Supplement to an Inquiry into the Integrity of the Greek Vulgate, or Received Text of the New Testament; containing the Vindication of the Principles employed in its Defence (London, 1830). ↑ F. H. A. Scrivener, A Plain Introduction to the Criticism of the New Testament, (George Bell & Sons: London 1894), vol. 2, pp. 183-184. ↑ Daniel Wallace, "Some Second Thoughts on the Majority Text", Bibliotheca Sacra, July–September, 1989, p. 276. ↑ J. W. Burgon, The Revised Revision (London 1883), p. 548. ↑ J. W. Burgon, Revised Revision (London 1883), p. 242. ↑ J. W. Burgon, The Revised Revision, p. 108; Edward Miller, Textual Commentary Upon the Holy Gospels, p. 75.